Clinical care reports presents a 28-year-old male who was involved in road traffic accident with suspected mild head injury. He did not have any complains except the minor trauma on account of which he was admitted for observation in our department. He had no family history of such illness. He is a university student. General physical, as well as neurological examinations, were unremarkable. 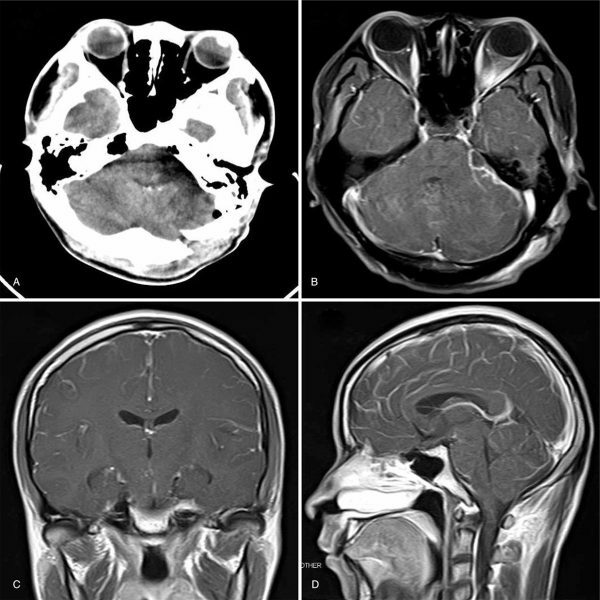 Computer tomographic scan (CT-scan) of the head revealed an incidental intracranial space-occupying lesion at the left cerebellopontine angle (L-CPA) measuring about 3.7 cm × 3.2 cm mixed signal intensities. We noted mild enhancement on contrast. There were multiple granular calcifications. The edges of the lesion were not well defined. The lesion was compressing on the brain stem and cerebellar hemisphere. These finding prompted us to do magnetic resonance imaging (MRI) and computer tomographic angiogram (CTA). MRI also confirmed an L-CPA mass with the above dimensions. The mass was cystic solid, multilobulated, isointense on T1, hyperintense on T2 as well as enhancing on contrast. CTA also showed that the left cerebellar artery and the bilateral carotid arteries were directly associated with the mass. These arteries were narrow but with no significant anterior cerebral filling defect. All other branches of the left cerebellar artery were normal. Our initial diagnosis was L-CPA tumor to rule out ependymoma and schwannoma. All other ancillary investigation (chest X-ray) and routine laboratory investigations were normal. The patient was scheduled for operation after counseling. The patient was put in the park-bench position after general anesthesia. To maximize the protection of the cranial nerves, routing use of inferior cranial nerves monitoring such as electromyographic (EMG) and auditory brainstem responses (ABRs) was carried out. We used the left far lateral approach to assess the tumor. Intraoperatively, the tumor was located in the left jugular foramen with a greater part (80%) of it at L-CPA. The tumor was multilobulated with cystic and solid parts. It was tough in consistency, yellow in color with rich blood supply. The tumor was also adhering to auditory nerve as well as left vertebral artery. We carefully isolated and preserved these structures as much as possible during the entire resection. We achieved total resection of the tumor with no neurological deficits. Postoperative CT-scan and MRI confirmed total resection of the lesion. 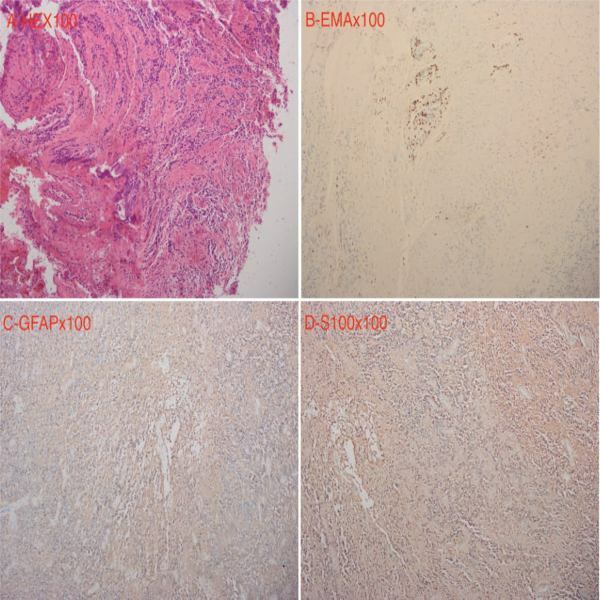 Immunohistochemical evaluation of the tumor samples revealed GFAP (+), S-100 (+), EMA (+), ATRX (+), CD56 (+), IDH1-1 (−), Oligo2 (−), Syn (−) with a Ki -67 positive rate of about 1%. 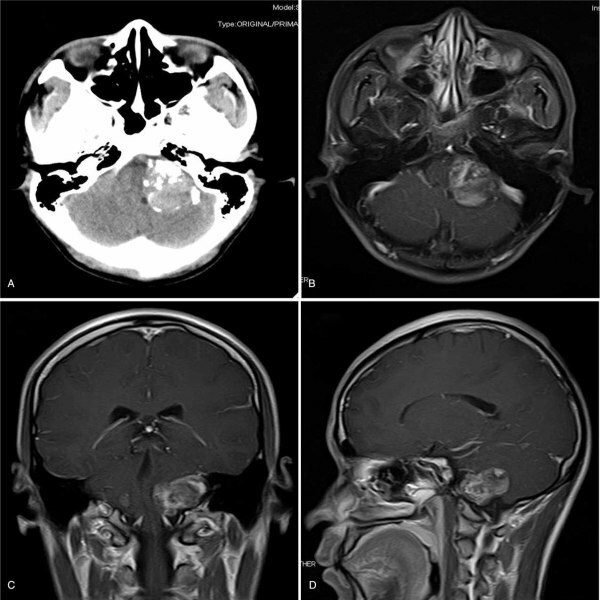 A comprehensive diagnosis of ependymoma (WHO grade II) with focal calcification was made. The patient recovered well postoperatively and was discharged home a week after the operation. The patient was further treated with radiotherapy. Two years follow-up revealed no tumor recurrence and the patient is well.